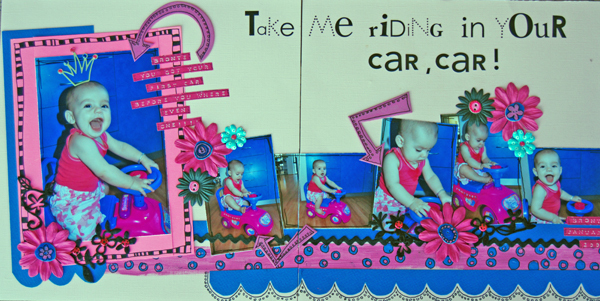 Chook Scraps Scrapbook Gallery - Take me riding in your car, car! Take me riding in your car, car! Here is my LO for challenge two. Not using pattened paper was a huge challenge for me. I have done lots of doodling and painting. The photos are ones I have been meaning to scrap but couldn't find pattened paper to match - so this cahllenged was well timed. Something different for me but I had heaps of fun doing it. I meant to say that I am currently working on a double page album for my DD and every page will have a title that is a song that we sing. Tracey this is beautiful! I love those bold colours with the white background and the title and arrows look brilliant! Stunning LO, love the bright colours and the gorgeous pics! The way you have doodled on the paper makes it look like PP, clever chook. This looks fabulous! It is so beautifully bright but not overdone. Your doodling is terrific. Fantastic. Really effective - it caught my eye in the gallery straight away - and I love the photo sequence. Oh, isn't she just the cutest thing? This is so gorgeous. I love the bright colours! Oh boy - I just adore this! How gorgeous. Don't really need patterned pp when you can doodle like that! Looks fantastic. Wow!!!! This is fantastic - love the bright colours, and how talented are you to create your own PP?!?!? Thanks girls for the lovely comments. I just wanted to say that I haven't made my own PP I have painted straight onto the cardstock and then used the end of a marking pen for the circles.... then a bit of doodling when it was dry. Wow, very different for you but it looks fab and suits the piccies so well! Awesome doodling too! !